﻿﻿I get to experience some wonderful views here on the top floor. Particularly where I sit, the window close by provides a nice display of this hill. The hill forms a nice shape that on a cumulous day, the shape is further enhanced by cloud formation. 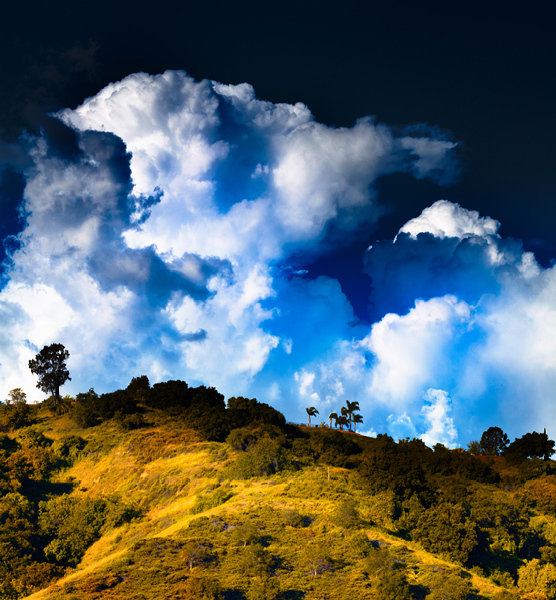 Aside from the clouds, what I like about this image is what is not there: there seems to be something behind the hill. It makes me curious. The hill offers two paths to go upward. Which path do I choose? The one on the left offers a straight and narrow way. Yet it is very open. The one on the right seems to provide more protection (from what I don’t know). It is wider and looks more challenging. Then the paths converge just before one gets to the top. Since the two paths do not go all the way up, at this point the hill challenges the viewer where to go. Do I go left or right or straight? I think too much.